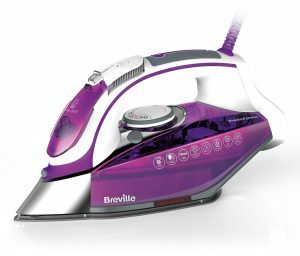 The Breville Press Xpress Steam Iron is one of the more unique models we have reviewed here on Royalirons.co.uk. Not only because of its flashy colour but because of it’s excellent performance at such an attractive price point. Breville is also a newer brand name and not as known as the larger names such as Phillips and Morphy Richards. Despite it’s recent entry into the steam ironing game they have so far proven to be a great reliable purchase for long term use. The Press Xpress is boasting an extra wide baseplate which has been polished to allow multidirectional pressing without any worry of sticking. This extra large base-plate is a good reason you should consider buying this iron, even if this was the only interesting feature. 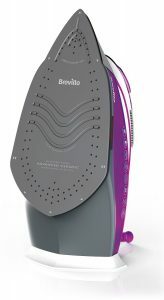 steam to get rid of large annoying creases that other smaller less powerful steam irons will struggle with. The steamer is also quite precise, rather than just doing a wide steam you can actually aim the steam precisely at the crease your tackling. A couple other neat little features include the ability to view the water level in the tank for convenient re-fills. This is a handy feature that many of the more expensive irons don’t even have. The Breville Press Xpress Steam Iron is also sporing a hefty handle with extra grip, which comes in handy during strenuous ironing sessions on multiple pieces of clothing. Some smaller styled irons can give you hand ache due to their skinny handles. This rugged little iron performs very well in general. It doesn’t have the perfect precision found in higher-end steam irons but it gets the job done very efficiently with a quality end result. 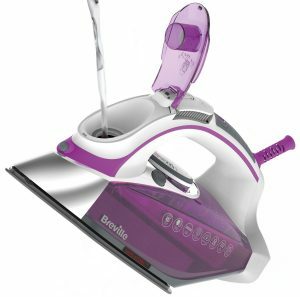 Overall, our impressions along with other reviews on Amazon really show that the Breville Press Xpress Steam Iron is a great all around performer. One thing you may want to consider before purchasing is it’s weight, which comes off as slightly heavier than some other irons in this price range. The water tank is also a little bit smaller than usual, coming in at 400ml, which honestly shouldn’t really be a deciding factor unless your doing huge ironing sessions. Besides the weight and smaller water tank there’s really no other obvious negatives! Your not going to find any fancy features, but if your looking for a reliable iron that will last a long time, have a good look at this model.